Please be advised our home has an alarm and surveillance camera system for the protection of our property and guests. The surveillance system is only on the exterior of the premises. Pets are never allowed. 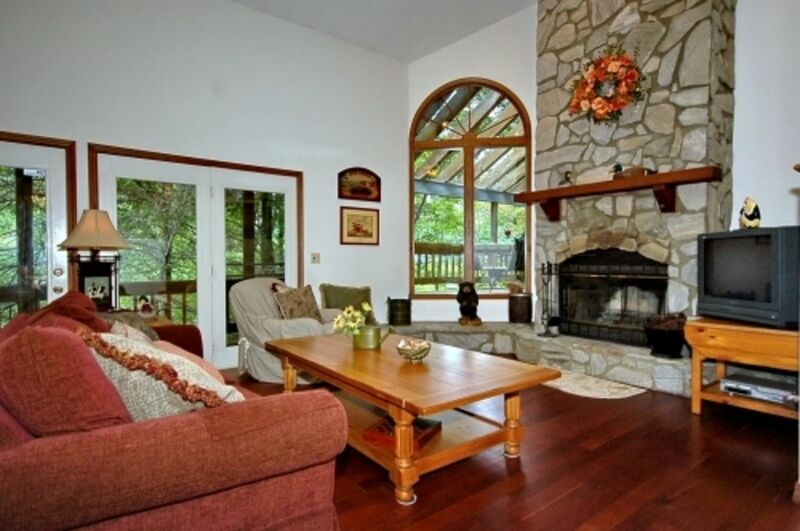 Relax on two elevated 47 foot wood decks overlooking a cascading stream directly below you in the Wild Acres section of beautiful Maggie Valley. Situated at about 3400 feet you will enjoy the sounds of a stream and waterfall a few yards away. You are surrounded by lush vegetation, with mountain views in the distance. Our 2500 square foot home has Cathedral ceilings, a wood burning 20 foot high stone fireplace, full dining room and well equipped eat-in kitchen. Every bedroom and Living Room have magnificent views and their own TV and DVD player. Streaming UTube TV subscription is installed only in the Living room and Master bedroom. Bedrooms 2 and 3 have TV and DVD players only. The Master bedroom on the main floor and living room have direct access to the deck through French doors. Two high ceiling Queen bedrooms and a loft with a comfortable Queen size sofa bed are upstairs. There is a reading room in the ground level of our home. Our home is centrally located up the hill from the heart of Maggie Valley. There are some Wild Game Trophies mounted and displayed on the walls in the living room area, reading room and on the Fireplace. Anyone with an aversion to hunting or viewing these animals may not be comfortable in renting our home, so please consider this before renting. You have accessibility on state maintained roads to restaurants and attractions. Master Bath has double sinks adjacent to Master Bedroom on lower level floor. There is a heat pump central AC unit for the entire house. Works perfectly It is recommended you set your cell phone to make and receive calls utilizing wi fi calling depending on your phone carrier. Master Bedroom and Living Room have Roku Devices installed. YOUTUBE TV streaming is functional on those TVs with over 40 channels including local channels. Turn on TVs and use Roku device to access. Only in Living room and Master bedroom. No normal Cable but Live streaming TV with UTube tv subscription with 40 channels. In 2 bedrooms and Living room. Thank you for your kind review and taking care of our home. We recently stayed at this beautiful home for the 4th of July holiday and it was simply amazing. The home is very spacious, the kids enjoyed every space of the house and so did the adults. The house is located on a mountain but it is very close to town. The house was very clean and the owner was fast to respond. I would definitely would love to stay there again. Great place to stay! Plenty of room for our family of six. The home was beautiful and clean, and there was plenty of room for our family of six. Everything was just as we expected from the website with the exception of having only 5 washcloths in the home. We ran down to the nearby dollar store and purchased a few more so it was an easy fix. The beds were very comfortable. Unfortunately it rained our entire trip so we spent a lot time napping and watching tv, but this home made our stay more enjoyable. We also enjoyed sitting on the porch listening to the brook below. If we return to Maggie Valley we would definitely stay here again. Ended up just 4 of us and the home was way too big. Lots of space, yet everything flows very well. The kitchen was well equipped (but no crock pot). We even had a few basic spices and coffee filters. The living room was perfect for watching movies by the fire. Upstairs nook had movie collection and books/games. Both upstairs bedrooms were spacious and comfortable. The master on main floor was great with walkout on to the deck. Master bath was dated but fully functional. Washer on main floor and dryers in basement with another "hangout space". Convenient to biltmore and Cherokee / Bryson city area. Thank you for your kind review and treating our home with care. We would love to host you again. On our next trip there ourselves, we will add a crock pot in our kitchen. My siblings and I gather each year for a church conference at Lake Junaluska. We gathered this year and four siblings and spouses used the Maggie Valley property as our base. The property is easily accessible, comfortable and with three levels large enough for people to have their own space. The outside deck on the street side of the house was spacious and relaxing. The kitchen was well equipped and the rooms were furnished tastefully. The reading room on the bottom floor was especially nice. The advertised animal heads were not a distraction, the wi-fi and TV reception were good and the home owner was easy to communicate with and work with. We were a little disappointed that the creek sounds were not as prevalent as we would have liked. Well, it sounded like you had a very nice time and appreciated the care and effort we have undertaken to make our guests as comfortable as possible. The flow of the creek and the corresponding sounds, factors attributable to mother nature, are out of our control. This home is located in Maggie Valley surrounded by golf courses, fishing spots, whitewater rafting, horseback riding, waterfalls, the Great Smoky Mountain Park and the Blue Ridge Parkway , all within about 5 miles. The Cataloochee Ski Resort is about 10 minutes away as is Waynesville and numerous local restaurants and attractions. By car, the city of Asheville and the beautiful Biltmore Estate is approximately 30 minutes away. The Cherokee Indian Reservation and a large Casino are about 20 minutes drive. Within an hour drive is Dollywood, Gatlinburg, in Tennessee. $175/$200 night, minimum 3 night stay, , $3400 month, $150 cleaning fee, and $200 refundable security/damage deposit. HOLIDAY RATES ARE HIGHER. The week beginning on Saturday , December 22, 2018 rents for 7 days or less for $1500, and there is no weekly discount. New Years week beginning on Saturday, December 29, 2018 rents for 7 days or less for $1500, and there is no weekly discount. Rental is based on a maximum of 6 persons. A $25 fee per day per person, will be charged for more than 6 persons. Rentals during the Holidays, Summer months, and the last two weeks of October may require a minimal one week stay.